History: Milady ran 149 races in her career and has been retired for three years but continued to live on the farm. She originally came to TAGS the end of January, 2011. She is now ready to be a lady of leisure in her lifetime home. 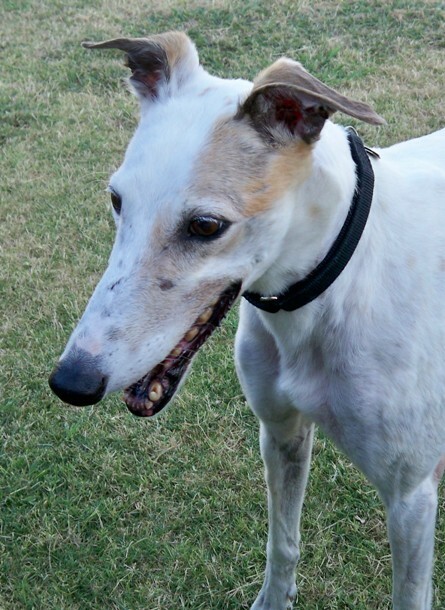 She is very friendly and affectionate to everyone and gets along well with the other Greyhounds, small dogs (with training) and cats (with training). She loves her soft beds and loves to snuggle as she dozes off into dreamland. You have to see Milady to appreciate her beautiful eyes, which have white eyelashes and black liner. The Thomas family with new member Milady, with Ringo and Luke. Milady with her little friend, Libby! March 25, 2015 update: Milady went to the Rainbow Bridge today and is now pain free. 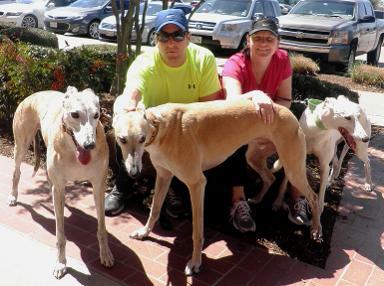 March 29, 2014 update: Milady was adopted to her lifetime home with the Thomas family and TAGS' alumni Ringo and Luke. March 13, 2014 update: Milady was returned to TAGS due to hard times falling on her family. 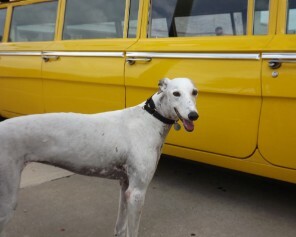 She was returned along with sister TAGS greyhound sister, Rita. 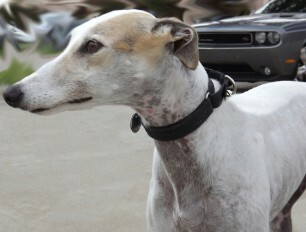 January 17, 2012 update: Milady was adopted to her lifetime home with mom, Sally. Congrats to both. 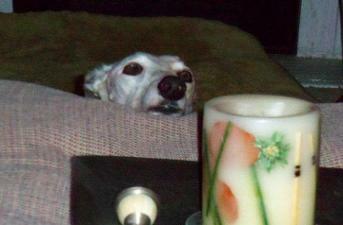 July 20, 2011 update: Milady’s chronological age is eight but she acts like a puppy. She has lots of energy and curiosity. She also loves to try to get out of small spaces. Watch open doors, car windows, etc. You don’t want to lose this one!! After checking everything out, all she wants to do is snuggle with a human and take a nap. She loves squeaky toys. She moves them from one room to the other. She’s one busy girl. You’d think at her age she might want to settle down – but no, she has a spring to her step and a glint in her eye. 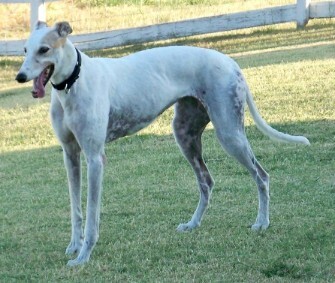 Milady also fetches the ball and loves to “snorkel” in the pond at her foster home. 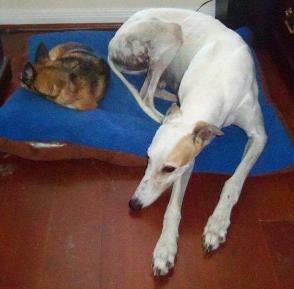 Milady loves to be around her humans and will even get up from her bed to follow her foster mom from room to room. She has shown no desire to get on people furniture and loves her big puffy bed on the floor. She’s a very smart girl. When she first came to TAGS she already knew how to sit. She’s very smart and now knows “sit ,” “down” and is eager to learn more. Teaching her to sit for treats or for her food was just an extension of something she does naturally (which is also unusual for a Greyhound). Her foster parents are practicing “come” all of the time and she is really getting quick to respond. She has another attribute that I’m sure many of you can appreciate. 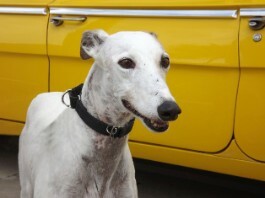 At events, she stands quietly by your side or gently walks up to people to be petted. She does not pull on a leash. She seems to like adults and children equally. Milady loves being with other dogs. 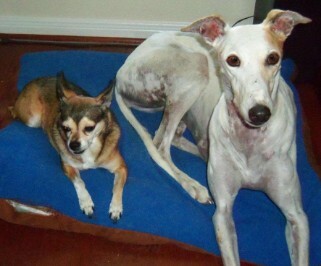 She is fostered with a Greyhound, a Basenji and two cats. She is learning to tolerate the cats and has made progress. Milady was adopted for a short time but did not do well as a single pet with her human working all day. She will do best in a home with other dogs and with humans who are not away from home for more than 5 or 6 hours. She lets you know she needs to potty by whining (and barking if you don’t react soon enough). She is continuing to sleep for 8 or 9 hours every night and make it 6 hours without a problem in her crate. Give this girl a chance to leap into your heart. It won’t take long once you see her. June 15, 2011 update: Returned to TAGS. 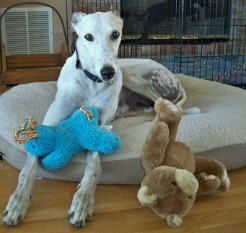 April 12, 2011 update: Adopted to her lifetime home. January 25, 2011 update: Came to TAGS to find her forever home.